We are delighted to bring you a guest blog from Professor Dave Goulson, an acknowledged expert on bumblebees and indeed a founding figure in the Bumblebee Conservation Trust. “This spring was the worst I can remember for bumblebees. In March and April, when queens would normally be trying to start their nests, it was bitterly cold and I guess many incipient nests perished. Through May and early June there were hardly any workers to be seen. I’m told that they are now picking up a little in the south of Britain, but in Scotland there are precious few still. Bumblebee feeding on a garden plant. Of course we have always had unpredictable weather. Bumblebees have been around for 30 million years or so, and have seen ice ages come and go, so they ought to be able to cope with a cold spell. Indeed, they can probably cope with cold weather better than most insects for they can fly when the air temperatures is close to freezing by using heat from their flight muscles to keep themselves warm. Unfortunately this is not the only stress bees face. Modern farming leaves little room for flowers, and so their food supply was massively reduced in the twentieth century as hay meadows and hedgerows were swept away. New diseases have been accidentally introduced, such as the parasite Nosemaceranae from Asia, a disease that affects both honeybees and bumblebees. 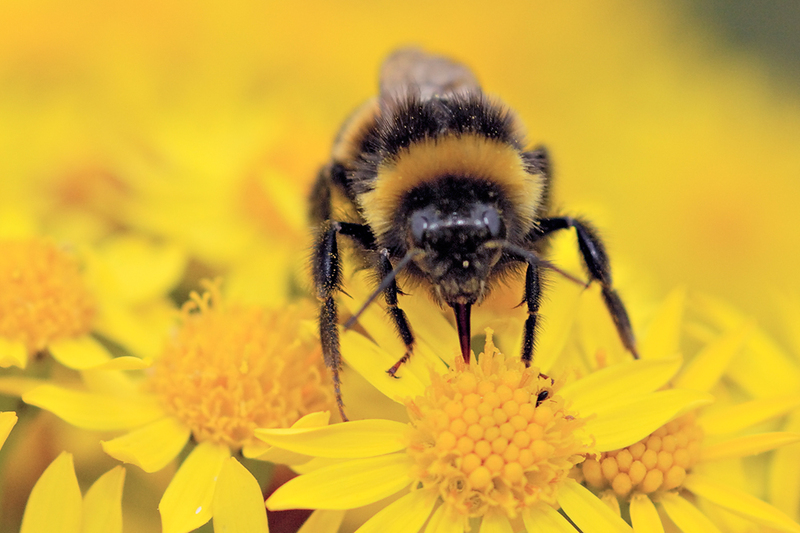 On top of this, systemic neonicotinoid insecticides have become widely used in the last 20 years, now suspected of causing all sorts of sublethal effects in bees including impairing their ability to navigate and learn how to gather food. Small wonder that the weather had knocked them sideways – half starved, infected with disease, and disoriented by poisoning with insecticides, it is a miracle that there are any of them left at all. Bumblebee feeding on ragwort flower heads. As a result of all this, many bee species have declined. Some have gone extinct in the UK, while others cling on in remote regions such as the Hebrides where farming is less intensive. This is pretty alarming, because of course we need bees. Bumblebees are major pollinators of many crops, including for example raspberries, blueberries, tomatoes, apples, runner beans and so on. 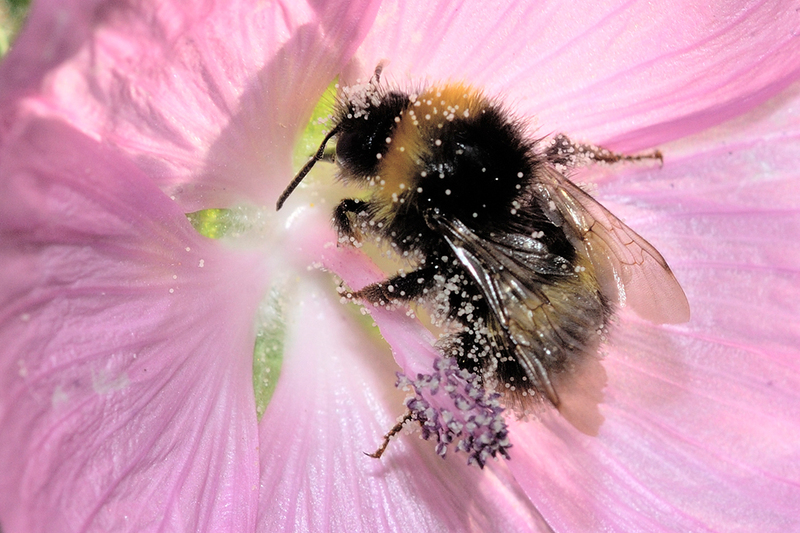 Globally, three quarters of the crops we grow are pollinated by insects of one sort or another, predominantly bees. And of course the majority of wild flower species depend on them for pollination. Bees need our help, and we need them, so it is time to act. This entry was posted in Flowers, Insects and tagged A Sting in the tale, Bee, biodiversity, Bumble bee, Bumblebee, Bumblebee Conservation Trust, Dave Goulson, Hebrides, Scotland, Scottish Natural Heritage, SNH. Bookmark the permalink.